dude, he hit it so hard he made the windows disappear! 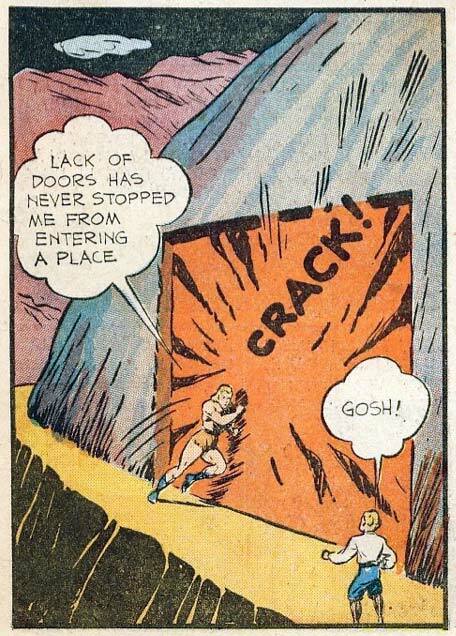 I just love that in every issue, Samson either smashes through walls to enter a building, throws a building over a cliff or into another building, or in some other way destroys a building. Apparently his creator really, really hated buildings. maybe he went to school to be an architect, and was told his designs stunk, so he became a comic book artist to take his frustrations out. What’s the opposite of a Doorman/Club Bouncer? Because Sampson could have a real future in that gig. I’m vaguely disturbed by the rounded lettering on “CRACK!” Cracking noises to me are not bubble-letter noises. Also, what’s wrong with breaking in through a window like everyone else? @Bael: He could do a good job as a jackhammer/sledgehammer substitute too. What I want to know is: Does the sidekick have any powers or is he just there to be Mr.Obvious/comic relief? David is an ex-Boy Scout (in 1940, that was the equivalent of being an ex-Green Beret, apparently) who’s an expert with the lariat. Which is lucky, because in 1940, lariats were everywhere. Also, he possesses luxuriant, curly blond hair, which is a must for any sidekick of the Coiffed One. So basically, no, no super powers, at least to this point. I have noticed, though, that it was a pretty standard progression in those days to start out with an unpowered sidekick who eventually got the powers of the main character. For instance, Magno can give Davey magnetism powers for one hour by “super charging” him. Also, Bulletman, Bulletgirl, and Bulletdog. I can’t believe I wrote that last sentence, and that it is actually true. I wouldn’t want to live in a world where that last sentence wasn’t true. Gees, what a jerk. First he comes across a cliff dwelling and he’s never seen one before so we know he’s not much of a world traveller. Then he decides to enter uninvited and destroys the entire building. Quick, shave him bald and get out the electrology kit.